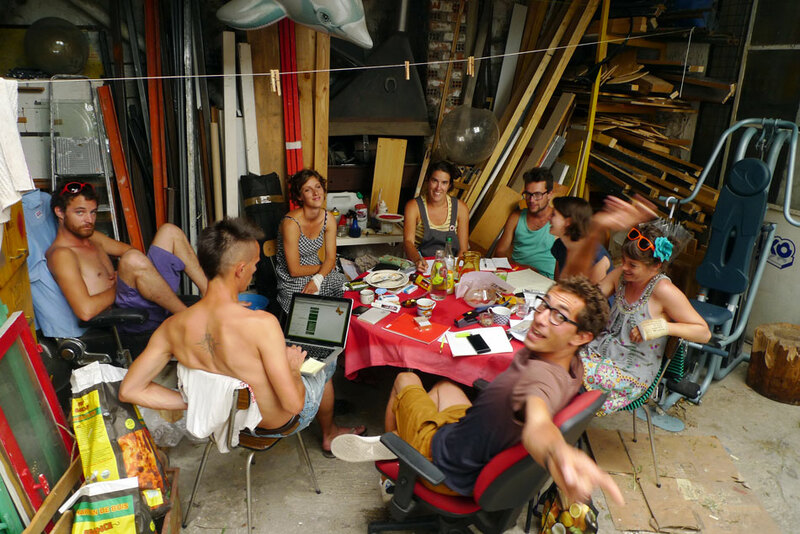 La Folie Kilomètre is a live art collective based in Marseille (France), gathering together performers, artists and designers. 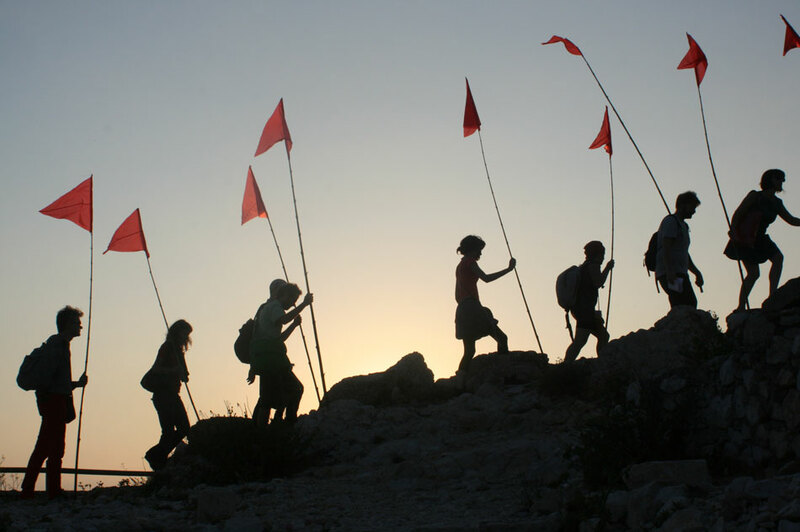 Combining these disciplines, we create live theater performances, artistic expeditions and walks, workshops. Our work questions the way we live, dream and transform our daily life environnement (cities or landscapes). The audience is always involved in our proposition : they actively take part as a group, they become actors of there own experience. Our work draws from our individual experiences as artists, comedians, scenographers, geographers, landscape designers, technicians, administrators, producers, authors and designers. What would happen if the Loire overflowed? What would happen if the levees broke and several meters of water flooded the city of Tours? Coinciding with the renewal of the city’s Flood Risk Prevention Plan, La Folie Kilomètre presented Jour Inondable, a 24-hour interactive journey that sought to explore the scenario of a major flood in Tours. The experience involved both real and imagined situations: conferences with flood experts, an emergency radio show, a simulated city evacuation and a museum of salvaged objects. The interactive experience was organised with the co-operation of 60 partners including civil authorities, scientists, bus drivers, ice skaters, radio announcers and the French Red Cross. See all the pictures of the performance Jour Inondable. Mise-en-scene of everyday life landscapes. 2011, Variation sur l’empêchement, with the Art-Cade galley, Marseille. 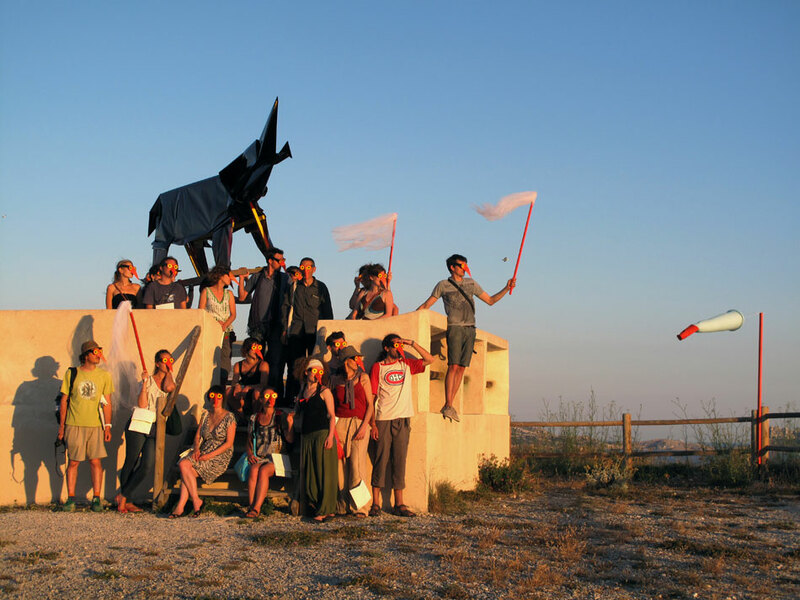 2011 and 2012, Transhumance #1 and #2 with MIMI music festival, Marseille. 2012, Azimuts, in association with Villa Fontanella, Fontaine-le-Compte, Vienne. Walking is not just a mode of transit – it can also be a form of leisure and a mode of escape. A walk is something immaterial, a lived moment. The Pictorial Promenade renews our understanding of our everyday surroundings and our movements within them. Participants are given maps at the start of the event. These maps allow the participants to orient themselves. They also offer a sensitive vision of the landscape. Plastic installations such as giant words are placed at key points. Tableux vivants complete the picture, revealing the hidden magic of the place. Wielding long walking sticks which make them visible from a distance, the walkers become part of the ‘landscape’ of the installation themselves. The Pictorial Promenade is something to be witnessed and experienced. Urban exploration workshops along bus line no. 70, Marseille from November, 2011 to September, 2012, in association with Lézarap’ arts, Marseille, in partnership with the La Calade High School, Marseille. In February, 2012, presented in partnership with Saint-Exupéry High School. Mixing an artistic and a geographical approach, the Line 70 project has several educational aims : to encourage participants to become better ‘readers’ of urban spaces, to foster an inter-disciplinary approach to the interpretation of the city, and to instigate a dialogue with place. Throughout the course of several workshops, pupils work in groups, experimenting with various methods, rules and games. The project aims to concretise an understanding of the city as an object worthy of subjective and objective study. Performance on the roofs of the city / work in progress. Co-producers: pOlau / Festival Scène de Rue. Project awarded the “Écrire pour la Rue“ grant by the French Ministry of Culture / SACD. Residencies: Marseille, Tours and Mulhouse, 2012. 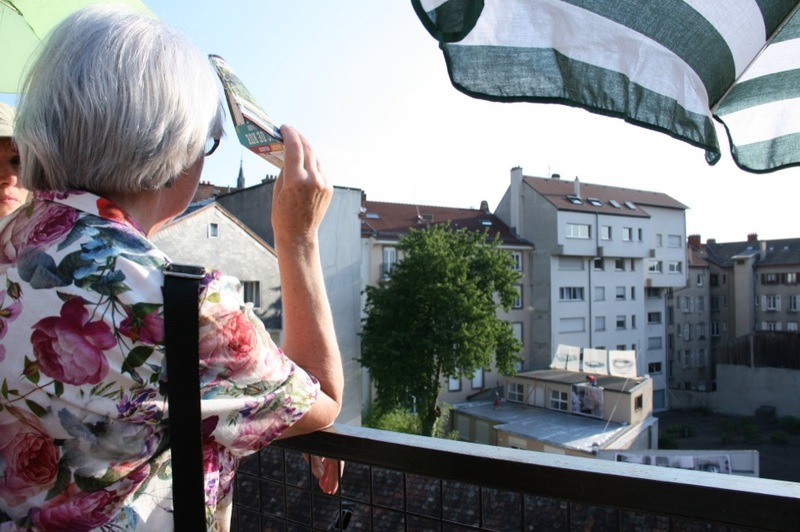 Public representation in Mulhouse, July, 2012. The Canopy is a performance which takes place on several roofs of a house block. From this vantage point the captive audience bears witness to a virtual comic strip, with a series of characters and situations projected on the immediate surroundings. The characters which appear adopt every day life gestures (walking, napping, sitting, hanging out washing) which evolve before the viewers’ eyes. Soon giant sweepers emerge, their brooms provoking the dissolution of the projected scenes. A bathtub becomes a bowl of soup, a family meal explodes in a shower of crockey, a pair of sleepers find themselves on a roof. The Canopy is a life-sized, real-time cartoon. See more pictures of La Canopée.